He also admitted that Ben Stokes' absence has left a massive hole in the line-up. English wicketkeeper-batsman Jos Buttler is of the opinion that England need to be more clinical in some aspects in their quest to extend the lead over India in the ongoing Test series. The home team went 1-0 up after winning the thrilling Edgbaston Test by 31 runs and will lock horns against Virat Kohli’s men in the second game at Lord’s which is set to commence on Thursday. One of Buttler’s focuses was on catching – an area where England failed to shed the ‘ordinary’ tag – in the first Test. Kohli, who hit an epic 149 in the first innings to bring India back into the game despite their batting failure, was dropped twice in the slips by Dawid Malan. Had England taken those catches, India could have got vanished from the game even faster. “It was a brilliant hundred from Kohli in the first innings, but you have to give the bowlers credit too. He really had to battle for all of his runs, and we created some chances which weren’t taken. That’s something for us to work on this week, trying to be more clinical,” Buttler wrote on Sky Sports. 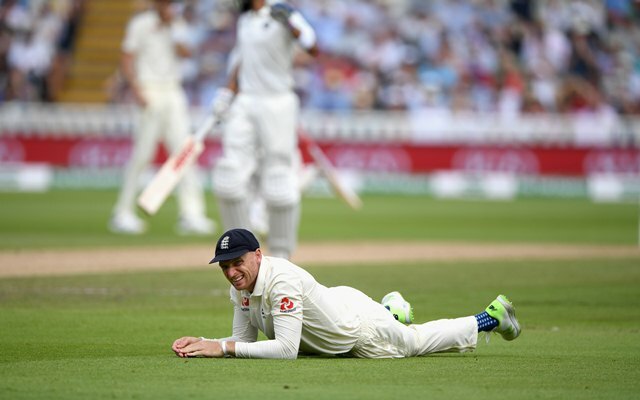 The wicket-keeper batsman, who came down late in the English batting order in the historic first Test (1000th for the hosts), did not have a memorable outing as he fell for 0 and 1 in the two innings. He also had a concern over England’s batting performance which was not too special but for India’s poor show. “Even though we won at Edgbaston, there are definitely some areas for us to work on. We were 216-3 in the first innings, with Root and Jonny Bairstow going very well, and we didn’t capitalise on that. And then bowling, we had India 100-5, but allowed them to get up close to our score,” Buttler was quoted as saying by the Times of India. England were bowled out for 287 from 216-3 after a brilliant throw from Kohli got his counterpart Joe Root run out. In the second innings, too, they were reduced to 87 for 7 and only a late-innings flourish from young Sam Curran saved the day for them. Jos Buttler said he was personally looking forward to doing well at the iconic venue and also admitted that the Ben Stokes‘ absence has left a massive hole in their line-up.